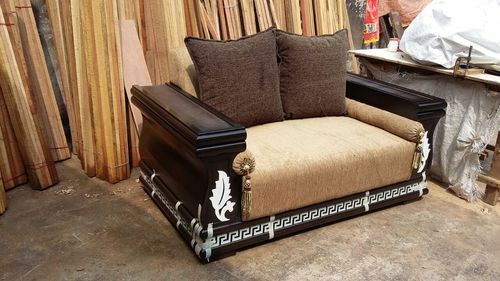 So as to fulfill the ever rising demands of our patrons, we have brought forward an inclusive array of Two Seat Wooden Sofa. Obtainable with us in a number of provisions and altered forms, these offered products are enormously demanded. As well, these products are well-reviewed before getting shipped at the doorsteps of our customers. Established in 1998, Dayalsons Furnishers & Interiors an well-known enterprise highly immersed in manufacturing and suppling an inclusive variety of Commercial Furniture, Convertible Sofa Bed, Dining Room Furniture, Wooden Bed, Wooden Cabinet, Wooden Chair, Wooden Dining Table, Wooden Dressing Table, Wooden Furniture, Wooden Show Cases, Wooden Sofa, Wooden Table, Wooden TV Stand and Wooden Home Furniture. In addition to this, these products are made up by making use of superior grade material altogether with sophisticated technology underneath the administration of nimble designers who have massive expertise in this realm. As well, these products presented by us are accessible in numerous sizes, designs and provisions as per the variegated desires of our honored clients.